Knight Area interview August 2007. 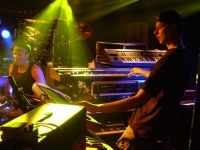 The Dutch Knight Area is absolutely one of my favorite prog-rock bands. Their new album "Under a new Sign" is right up the traditional lovers of bands like Pendragon, Marillion and IQ - but with a more heavy sound this time which also appeals to fans of Enchant and/or Magellan. Three years after Knight Area’s debut "The Sun also Rises" - which was more on a project level. The new album is more of a band thing, featuring the two main writers brothers Joop and Gerben Klazinga on flute and keyboard, respectively. The band (now featuring 7 members!) also also: Mark Smit on vocals and Fender Rhodes, Rinie Huigen & Mark Vermeule on guitars, Gijs Koopman on bass and Moog Taurus and finally Pieter van Hoorn on drums, Phew...! 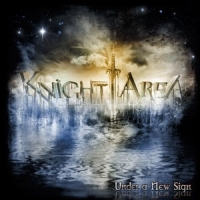 Q: You have just released a new CD under the Knight Area moniker called "Under a new Sign" and as far as I can see it got pretty good reviews all over the Internet Community and in several magazines, too - What do you think about that? A: Gijs Koopman: I’m very pleased about it of course. It also means that there’s still a place for progressive rock. It also means that it was worth working on it for over a year. Mark Vermeule: Yes, it’s always great to get good reviews for something that you have worked hard on. Q: The album "under a new Sign" has a very significant “old” expression – a modern sounding album of course, but also with big hooks, big big vocals and a lot of progressive songs – and with a Jon Lord-esque Hammond Organ from time to time. How would you describe the work process doing this very elegant new album? How did it start?? A: Gijs Koopman: Well Gerben writes the music. He comes with basic ideas about how the song will be. We work this idea out as a band during our rehearsals. When we finally record, Gerben makes a “guide track”. He records with the help of a programmed click-track the keyboards. Then I play the embryonic bass parts which will help Pieter van Hoorn to play his drum parts. When Pieter is finished I can play my definitive bass parts perfectly fitted to Pieter’s drums. Everything is recorded layer by layer. 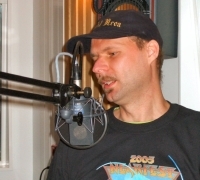 Then comes Mark Vermeule and Rinie Huigen to add their parts and Mark Smit to do the vocals. I added a lot to the final production. For example the panning of the instruments. To put on guitar more to the left and the keyboards more to the right and that kind of stuff. Q: You have joined forces this time around with several other experienced musicians/vocalists how did you keep the fire burning on the albums with a total of 7 groupmembers? A: Gijs Koopman: The first album was a project of Gerben. The musicians were “guest musicians”. 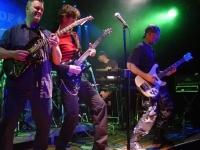 The band was founded because of a request of the record company “The lasers Edge” because they wanted Gerben to form a band to play live and sell more records. And eventually to perform on NEARfest in the USA. 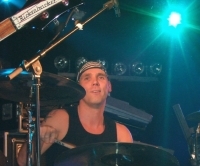 Not everyone who contributed to the first album was willing to play in a regular band because they had other obligations. I asked Rinie Huigen to do some of the guitar parts and later I asked Mark Vermeule (who I knew from the NoVoX project). There was enough chemistry between the members (who all had a very different backgrounds) to continue as a regular and solid band. It’s not always easy of course to maintain a group of this size but we managed. Mark Vermeule: you can say that again … with a lot of experienced musicians who all want to have a say about how things should be done, you can imagine that we have had quite some ‘discussions’, ha ha. But the good part is, when we’re on stage, we can put that all behind us. That’s what binds us: our love for music and performing. Q: How do you see the CD's chance on a very complex market of today? To me "Under a new Sign” is a superb album in the progressive genre. I really liked your first album – but it seems that you have taken the best of all these prime years and updated the sound and you maturing along the way? A: Gijs Koopman: Like I said before, the first album was a project. The songs where constructed on the hard disc recorder. To make the new album we used a totally different approach. We worked all the songs out as a band and everyone was able to put his own idea into it. A: Gijs Koopman: I consider myself as one off the “old school”. I’m influenced but names as Chris Squire and Michael Rutherford. I wanted to play like Chris Squire when I was around 15. The fact is that I bought my first bass guitar at the age of 23. I learned myself to play. 7 months after I took up the bass for the very first time I did my audition for Cliffhanger. Of course I told no one that I was green as grass because after only 7 months I could play very well for a beginner. No one noticed and I was hired! 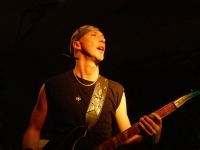 Mark Vermeule: I started playing about 15 years ago, because I liked … The Shadows!!! I actually played in a Shadows cover band when I was 13. 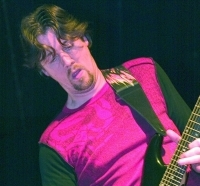 Since then I’ve really been into solo guitarists like Hendrix, Satriani, Vai, Malmsteen, etc. It wasn’t until 1996 I guess that I got interested in progressive rock / metal, after listening to Dream Theater. Q: The hard rock genre as well the more melodic genres – but also the more digestible progressive genre has suffered from less attention the last 5 years, but I think I can sense a certain optimism nowadays with new record companies, lots of websites, and lots of discussion groups on the Internet - how do you see the genre? And do you think the Internet is a help to promote your genre in general? You started out on a major label and has been on a small one – but this one is independent (and your own) isn’t it? Q: Can you give a detailed describtion of the tracks on the album? Do you have a concept or are the tracks fragments from a life in the Netherlands;-)? A: Gijs Koopman: I think it’s not easy to do that because the album is one peace to me. We gave it a feel of a concept album. Some theme’s and tunes are repeated all over the album to make it coherent. The album opens with "DM (A Different Man) #1" with fade in of storm sounds. The album end’s with "DM#2" also fading out with the same storm sound. When you replay this album in repeat you experience it as a circle. DM 1&2 is the “epic of the album and it’s a great pleasure to play this live. I like "Exit L.U.M.C." because it has a real “progressive” feeling. All the elements of the genre are in it. It’s a mini symphony. "Mastermind" has a more “prog metal” approach but than in our own distinguishable way. The title track is the instrumental. It is very groovy and a bit jazzy. I played the best bass parts on this peace. Q:How about yourself? What are you up to these days? And how about a tour in the future – including Denmark of course;-)? 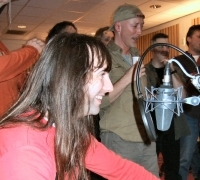 A: Gijs Koopman: Recently I was a whole day with Gerben in the studio to record sound effects for the next album. We are thinking of a concept album. I think it will be a darker album then the previous one. Yes we’d like to visit Denmark and do a tour through Europe. When the time is ready we’ll come! Thanks Steen! Q: I hope to see you in Denmark or some place in Europe then !? Thank you very much for your time. I hope that Knight Area will give it a go in 2007! Good luck with the new project, too!